Wash and soak the rice for 30 minutes in 1 cup of water . Add little salt and cook till its done.Spread the rice in a plate..
Heat oil in a a kadai and add the remaining 1 or 2 red chillies ( pinch into two) and the ground paste. Saute till raw smell leaves it..
Now add the cooked rice ,ajino motto , soya sauce & the required salt ..Mix well for few seconds. 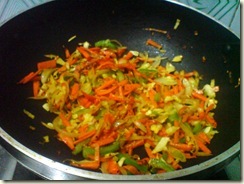 Add the finely chopped spring onions , mix well and switch off the flame. 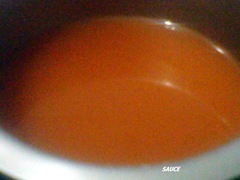 Serve hot with sauce/ketchup !! 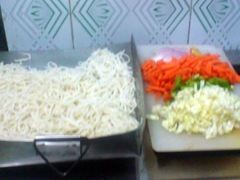 U can also try the same adding finely chopped vegetables to make it healthy.. Adjust the amount of red chillies according to ur taste buds. 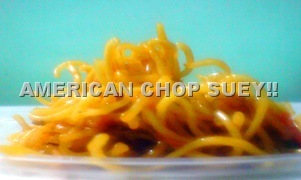 U can also replace sesame oil instead of cooking oil. Technorati Tags: Garlic fried rice recipe,simple fried rice,easy fried rice recipe,spicy fried rice,fried rice,chinese recipes,lunch recipes,chilli fried rice.. I had this Veg momos with garlic chutney in my friend’s house. She prepared both steamed & deep fried Momos. Both were tasting excellent. We liked it very much.Generally Momos are prepared only with Maida/All purpose flour.I have posted two versions , one with maida & another one with maida & wheat flour in 2 :1 ratio.But the color of wheat ones don't look good ;). After tasting these momos , my MIL started making it with wheat flour.She said it tastes good when eaten hot..More than the color , its healthy , she said :) I prepared a dip /chutney as an accompaniment. It was a nice combination.As i prepared idli along with momos , we had this chutney for both idly & momos. I’ve given the recipe for momo sauce/dip at the end of this post. As I prepared the dough & filling in very less quantity , i made less number of deep fried momos.. I wanted to update the pictures of momo as it the most popular post in my blog :) ..Before updating the old pictures , I wanted to see the shape of momos served here in restaurants. Last week my hubby took me to a chinese restaurant and there I tasted momos in different shapes.They looked very cute and small in size.. I wanted to try those shapes and I finally got the idea after watching an you tube video of veenas kitchen where she had posted the recipe from the chef’s hands. He had very well explained the different shapes..Thanks a lot to veena’s kitchen and the chef . I have tried to give the step by step pictures for different shapes. Hope I can make it perfect in future ..Last but not the least , momos has to be served really hot to enjoy its original flavour & taste. Salt & water – as required. Mix Maida with salt,water and a tsp of oil to make a soft pliable dough.Keep it covered for 30 minutes. Chop all the vegetables very finely..Take a wide mouthed kadai with 2tbsp of oil and add the onions & garlic pieces.Saute for sometime.Then add vegetables. Saute well in high flame, keep tossing for 3 minutes.Add salt , soya sauce ,White pepper powder and Ajinomoto (optional ).Toss it well and switch off the flame. Now take the dough and make very small sized balls ( 20 gms weight) of even size. Roll it to make a thin small poori of 4-5 inches. Then take a tsp of stuffing and keep it in the center of the poori. Please refer here for the last shape.. Arrange the momos in a greased plate. 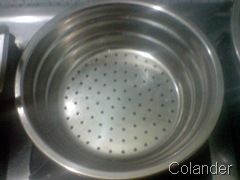 When the water in the idli pot starts to roll boil, keep the plate inside. Steam in an idli pot for 7-8 mins. Add a tsp of oil in idli pot water while steaming !! You can also deep fry the momo in oil till it tunrs golden ! 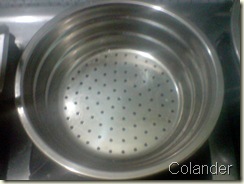 Transfer to a serving bowl and Enjoy with Momos / Idly / Dosa. Here is a picture of momo with wheat & maida combination …Here i used 3/4 cup of maida & 1/4 cup of wheat flour.. 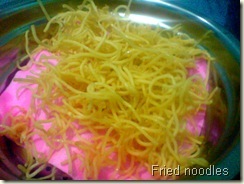 I tried this one after watching a cookery show.I prepared this for my hubby’s lunch box.It was very tasty. 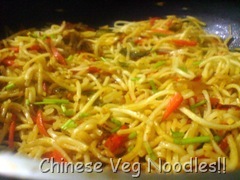 VEGETABLES (CARROT , CAPSICUM , POTATO AND BEANS) – Cut into thin strips of 1 inch length. 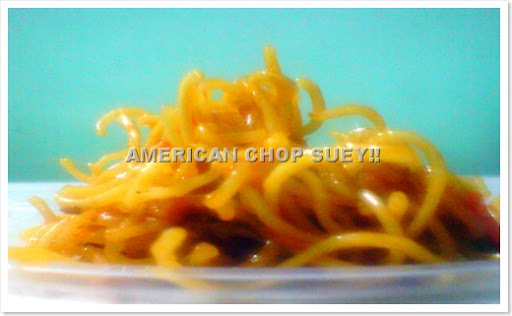 Refer here for “ Basic noodles preparation “.Keep the prepared noodles aside. 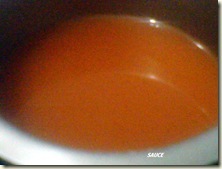 For sauce , grind all the items given under “ sauce ingredients “ to make a smooth paste by adding vinegar.Set apart. In a wide mouthed kadai , add the onions and fry for a minute.Then add the veggies.Fry till they become soft. Cover cook for sometime.Add 2-3 tsp of schezwan sauce and fry till its raw smell goes off. Then add the plain noodles , tomato sauce , soya sauce , Ajinomotto & required salt . 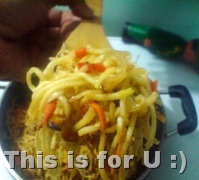 Toss it well.Garnish & serve hot !! Yesterday i tried both the dishes with a packet of whole wheat plain noodles..They came out very well and my hubby rated excellent for both.. 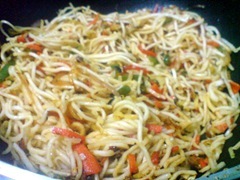 I have seen american chopsuey in restaurants but never tasted it..When my MIL came here she told about this which she had watched in a cookery show.I was googling and finally i got Tarla Dalal’s recipe ..I made some changes in the recipe..As i am not aware of the taste, i was waiting for my husband’s comment..He told it tasted like in restaurant .. 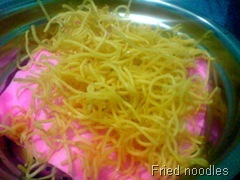 I was very happy and raised my collar ..But when u want to try this, u should not mind about ur diet /calories..
Add a tsp of oil(prevents sticking) and salt to a bowl of water..Put the noodles ,boil for 10 mins(Do not overcook) and immediately strain it in a colander by adding cold water (to take off the extra starch ). Let it cool..For this chop suey , Deep fry in batches till crispy & place it on a absorbing paper ..
Place the fried noodles apart..
Cut the veggies as mentioned above and saute it well(till it gets cooked) with a tbsp of oil in a kadai. Set aside. put to boil. Go on cooking and stirring until the sauce is thick. Add more water if necessary.. Check for the taste,(it should be sweetish)..If u want u can add more ketchup at this point and mix well..
Chop all the veggies as said above and set aside. 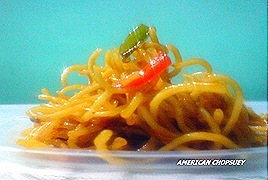 Do the **basic noodles preparation..Once its cool..set apart. Heat Oil in a kadai and add the chopped ginger,garlic and onion pieces..
Saute well and then add the chopped veggies ,salt and sugar so that the color doesn’t change and will be cooked quickly..Saute till they are completely cooked.Saute in a medium flame. Then add the Ajino motto, soya sauce, white pepper powder and mix well.. 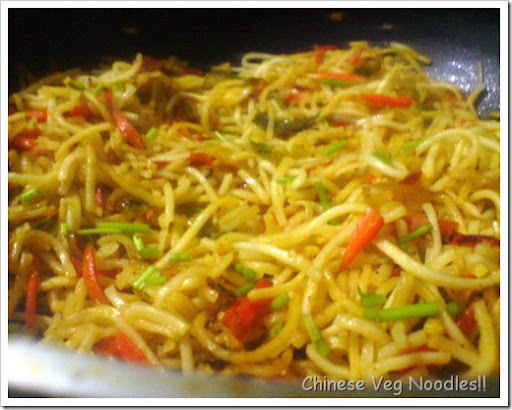 Finally add the noodles gently by stirring and fry till noodles become steaming hot..I used a fork like ladle so that the noodles don’t break.. 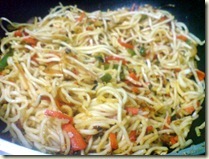 I took this recipe from “Aval Vikatan “ magazine under international cuisine section. I’ve done this 2-3 times so far.Its always a hit !! Water – little to sprinkle. Knead the dough using Maida,salt,hot water and a tsp of oil and set aside. 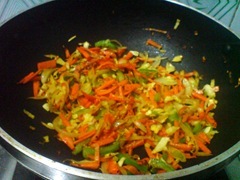 Heat a wok/kadai with oil and add the finely chopped ginger,garlic and green chilly .Fry for a min. Now add the grated onions and saute for a min. Now add the salt,soya sauce and ajinomoto.Toss it well. Finally add the white pepper powder and mix it well. Now sprinkle some water and close the kadai with lid. The veggies will be fully cooked . Now switch off the flame and close it with a lid. For 1 cup of Maida,u can make 5-6 chapattis. Take the dough and make balls of even size as we make for chapatti. Roll it into a thin chapatti. Take 2 –3 tsp of stuffing and keep it the center. Now close all the sides of chapatti to make it a square and roll it once.I hope the picture gives u a clear idea!! Heat a dosa tawa and put the paratha over it. Sprinkle some oil and cook both sides till golden brown. 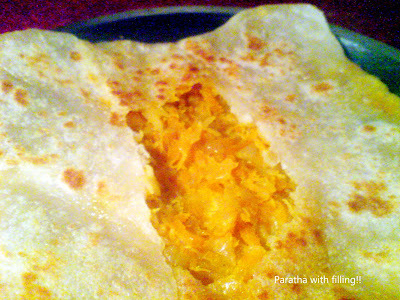 Malaysian paratha is ready to serve with raita or pickle of ur choice! !